These outrageously Crispy Honey Roasted Chickpeas only require 5 ingredients! These versatile chickpeas are crazy easy to make and perfect on pastas, salads, potatoes and more! Plus, I’ve included tips on how to make truly crunchy roasted chickpeas! After posting a hearty ragu bolognese and sweet glazed donuts, posting something a little healthier just felt like the right move. But don’t worry, while these snack-tastic little chickpeas are healthy, they are far from boring! These chickpeas, with their blissfully crunchy exterior and slightly creamy, tender interior, are EVERYTHING! Salty, savory and slightly sweet, these roasted chickpeas are irresistible and mega delicious! Outrageously crispy, impossibly crunchy roasted chickpeas slathered in honey, sprinkled with flaky sea salt and dusted with ground ginger. While some people may refer to these humble, pop-able chickpeas as merely a snack, I declare them a lifestyle. In all seriousness, there isn’t any food situation these addictive crispy chickpeas can’t improve! Need a healthy snack? Grab a handful of these honey roasted bad boys. 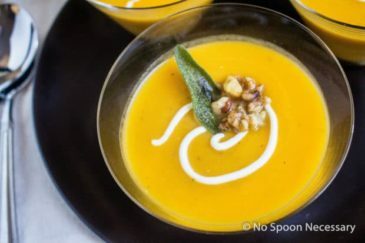 Need to spruce up a bowl of soup? Garnish it with these! Bland baked potato? Say hello to your new favorite ‘tater topper! Boring salad making you sad? Spruce it up with a scattering of this crispy deliciousness! Want to take your sunny side up eggs to the next level? Sprinkle on a some of these! 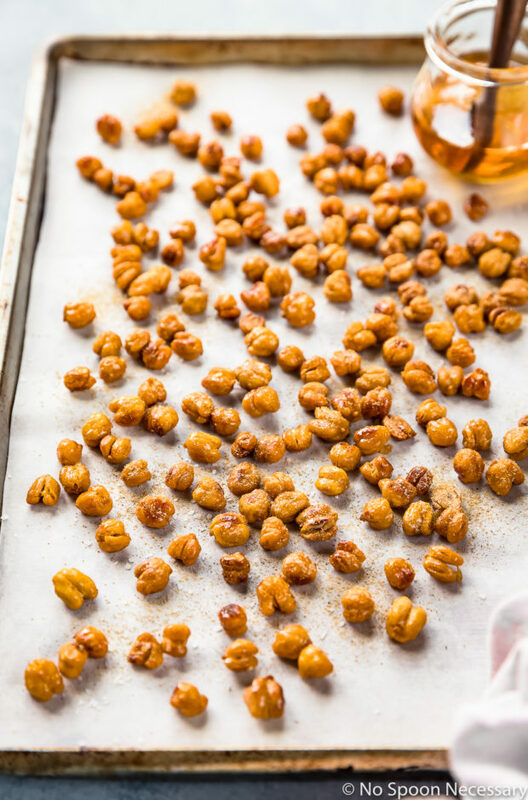 Obviously I could continue, and go all out Bubba Gump on you, but I think you get the point – these crispy honey roasted chickpeas are the MVP of breakfast, brunch and dinner, and you need them in your life! 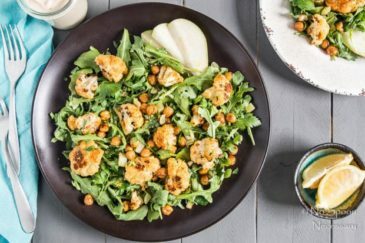 How to get roasted chickpeas crunchy? 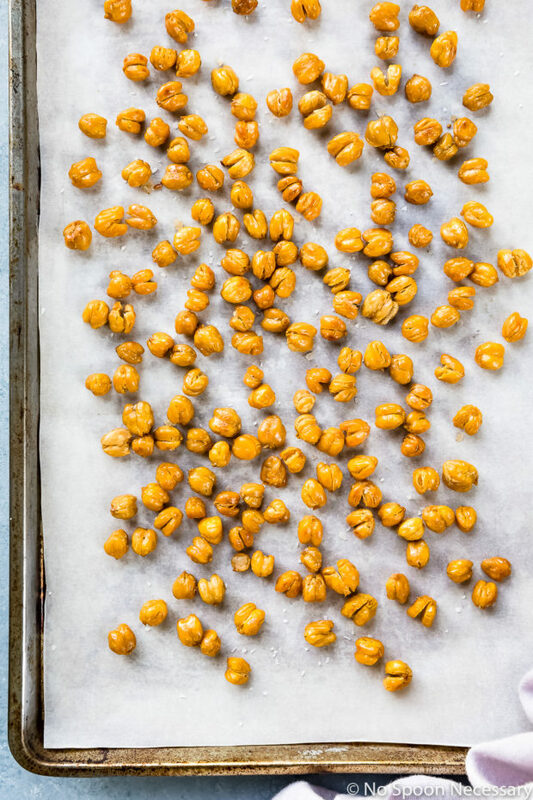 There are a few tricks and tips to get roasted chickpeas truly crunchy and crispy. 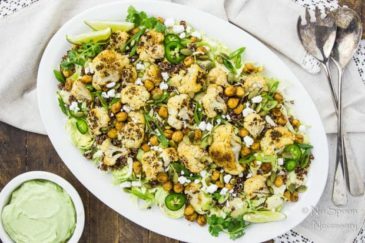 If you are short on time, you can skip a few of these steps, however each step is important if you want chickpeas that are actually crispy with tons of crunch! Rinse, drain and dry. After rinsing and draining, make sure you dry the chickpeas really well. The less moisture on the chickpeas, the crispier they will be! Peel the skins. Removing the skin from the chickpeas helps a ton! I know it’s a tedious task, but it is worth the effort! Dry the chickpeas in the oven. Spread the chickpeas out on a baking sheet and bake in the oven for 8-10 minutes to completely dry out the chickpeas before tossing with oil and seasoning. Bake at 400 degrees Fahrenheit. Toss the chickpeas with oil and desired seasonings. Bake for 20-25 minutes. Allow the chickpeas to sit in the oven. For truly crispy chickpeas, turn the oven off after roasting and allow the chickpeas to sit in the warm oven for an additional 15-20 minutes before serving. Oven roasted chickpeas are a healthy snack choice or a great addition to various dishes! Chickpeas are a great source of dietary fiber which can help you feel fuller for longer. As well, chickpeas are loaded with protein. One cup of roasted chickpeas equals a single serving of protein. On top of all that healthy jazz, chickpeas are also an excellent source of antioxidants, calcium, folate and vitamin B. 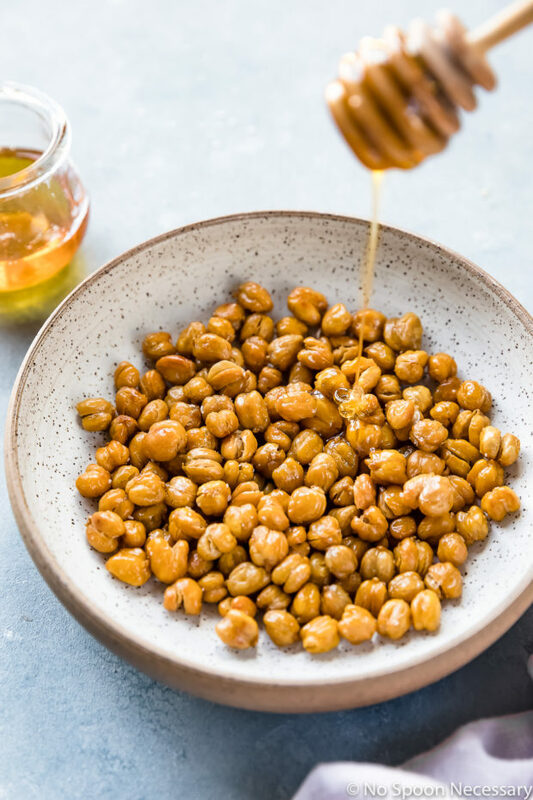 If you are looking for a quick and easy, healthy snack that isn’t loaded with sugar and artificial additives, crispy chickpeas are a wonderful option! What to serve with roasted chickpeas? What to season roasted chickpeas with? There are so many flavor possibilities and seasonings to pair with crispy, nutty chickpeas! Below are a few flavor combinations to try on your next batch of homemade crispy chickpeas. How to store roasted chickpeas? Do roasted chickpeas need to be refrigerated? After roasting chickpeas, make sure to let them cool completely before storing! The best way to store roasted chickpeas is in a parchment paper, or brown, bag. 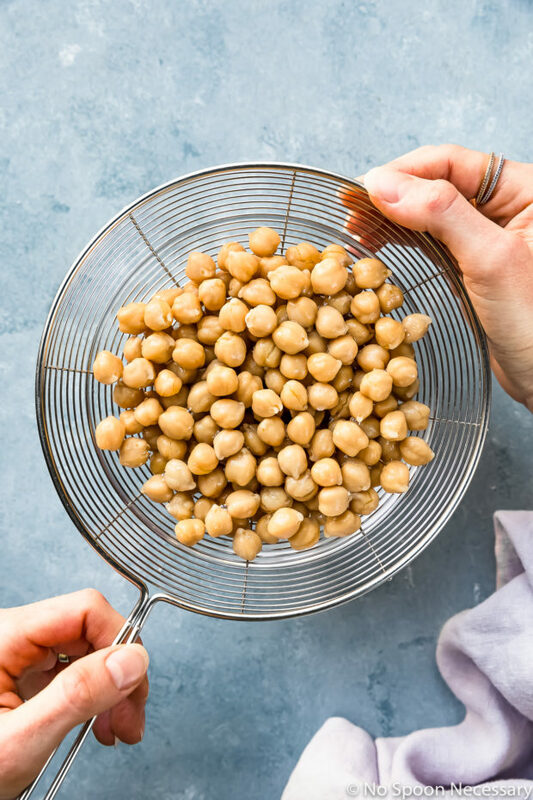 However, you can store leftover roasted chickpeas in a container or jar, just make sure to leave the lid cracked open so the chickpeas can breathe and moisture doesn’t build up! Roasted chickpeas do not need to be refrigerated, and they should be stored at room temperature. How long do roasted chickpeas keep? Properly stored, crispy chickpeas do taste best if consumed on the first day, however they will stay crispy and keep for 4-5 days at room temperature. Can roasted chickpeas be frozen? Roasted chickpeas can be stored in a freezer safe, zip-closure bag and frozen for up to 1 month. To get truly crispy chickpeas you need to rinse, drain and dry the canned chickpeas really well! I recommend rinsing and draining the chickpeas then transferring them to a dish towel or thick layer of paper towels. Pat the chickpeas dry and then let them air dry. The more moisture you remove from the chickpeas, the crispier they will be. While removing the skin from the chickpeas will ensure crispier roasted chickpeas, you don’t have to painstakingly remove all the skin if you do not want to. Simply remove and discard any excess skin that comes off while you are thoroughly drying the chickpeas. Crispy chickpeas will keep in a paper bag or a container on the counter for 4-5 days. Leave the lid on the container cracked open to prevent moisture buildup and to keep the chickpeas crispy. 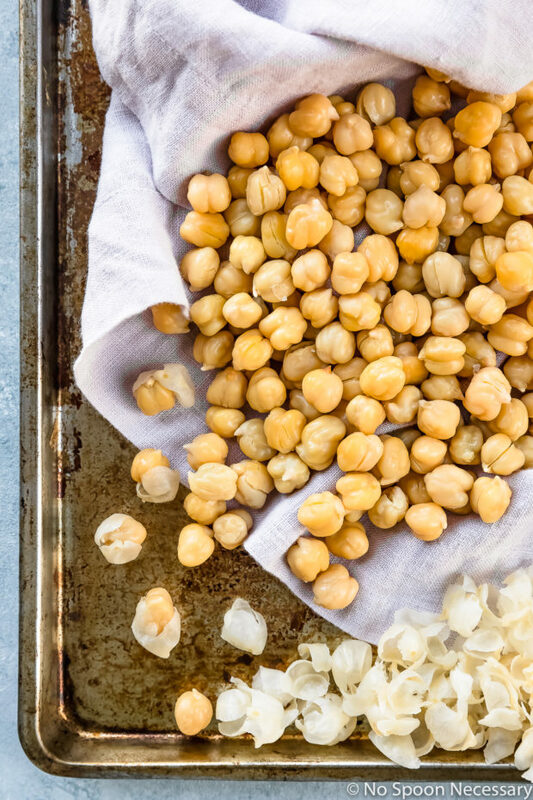 Perfect for snacking or adding a boost of protein and flavor to boring meals, these chickpeas are satisfyingly crunchy and delightfully delicious! 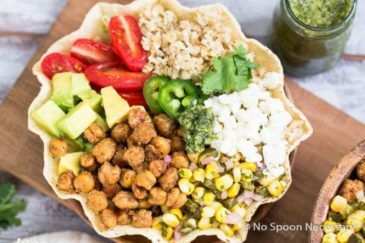 Grab a can of chickpeas from your pantry and get ready to transform them into something magical!! Until next week friends, cheers – to the humble little chickpea. 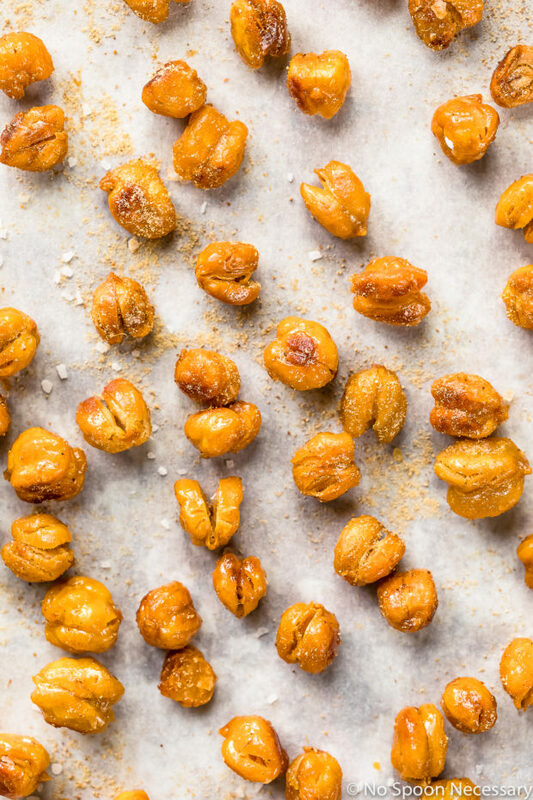 These outrageously crispy Honey Roasted Chickpeas only require 5 ingredients! Simple to make and packed with flavor, these versatile chickpeas are perfect on pastas, salads, potatoes and more! 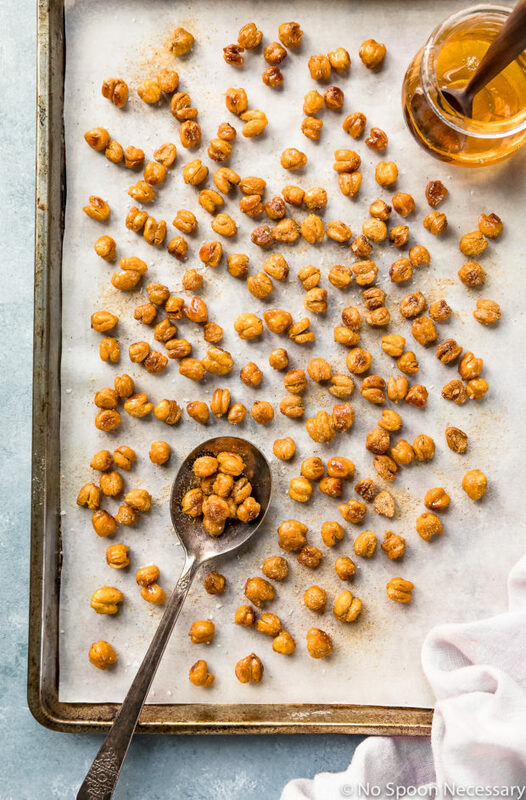 Plus, tips on how to make truly crunchy roasted chickpeas! Preheat oven: Arrange baking rack in the middle of the oven and preheat oven to 400 degrees F.
Oven dry chickpeas: Spread the chickpeas out on a rimmed baking sheet. Place chickpeas in the oven and bake for 8-10 minutes, or until chickpeas are completely dry. 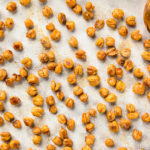 Toss dried chickpeas with oil: Remove chickpeas from oven. Drizzle with 1 tablespoon oil and sprinkle with salt. Use your hands or a large spoon to evenly coat the chickpeas. Spread the chickpeas out in an even layer on the baking sheet. Roast chickpeas: Roast the chickpeas in the oven for 20-25 minutes, stirring or shaking the pan halfway through. Chickpeas are done roasting when they are golden brown and crunchy. While chickpeas are roasting: In a medium bowl, whisk together the remaining teaspoon of oil with honey. Season with a pinch of salt. Set aside. Toss chickpeas with honey: Remove chickpeas from oven and transfer to bowl of oil/honey mixture. Sprinkle with ginger. Stir well to coat completely. Return chickpeas to baking sheet and spread them out in an even layer. Roast again for 5-8 minutes, or until honey is caramelized. OPTIONAL: For truly crispy chickpeas, turn the oven off after roasting and allow the chickpeas to sit in the warm oven for an additional 15-20 minutes before serving. Serve: Sprinkle with more flakey salt and ground ginger. Enjoy! I can imagine so many ways to enjoy these tasty, crispy chickpeas! Perfect snack and a great to add crunch to almost any sweet or savory dish! Dang girl! I don’t think I have any questions about chickpeas because you answered them all! A few years ago I did a post with za’atar chickpeas but you have me craving these honey roasted ones like right now! As we speak! Pinning! And since I just started counting calories (thought I’m officially NOT on a diet) these sound perfect! Sweet, salty with a spicy kick from fresh ginger…so yummy! I love to use them as the salad topping for the crunchiness.